- Mamoru getting his Manga Powers and his rightful Crystal. Omg you no idea? Like it would mean he would be more proactive in fights WITH the team and help support them still. It would acknowledge that he has a crystal like Usagi and puts him on equal footing in the shows. It would also have made most people who made fun of him take him a bit more seriously than a joke. Like, you have no idea what that one change could've done. He probably wouldn't have broken up with Usagi if he had gained Tuxedo La Smoking bomber or at least would've gotten back with her sooner because THEN he'd feel able and confident enough that he could, very well, protect her. The entire Story would be better for SuperS. You could still have the romance but could easily have Fisheye have a completely different crisis of morality that still ends up with the Trio rebelling against everyone and getting a redemption all because of Fisheye's suspicion of not having a dream mirror but also because Fisheye cares for Mamoru so much, that they rather take the punishment than sacrifice him. Like, a lot could've been done with that one change. The first season is the most rewatchable. But S is my most favorite season in 90s anime. 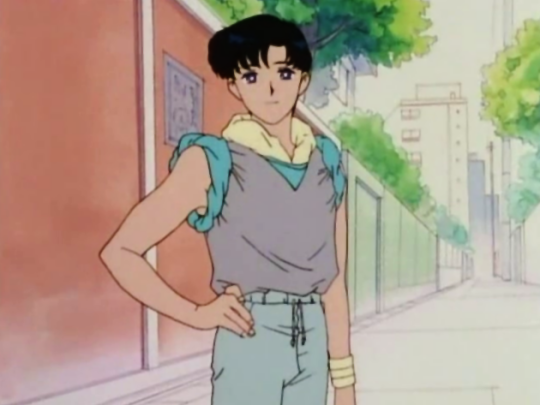 Day 10: Which of Mamoru's outfits is the worst? Do you like any of them? I don't think his outfits are all that bad, the 90sness of them only makes them better in my eyes and I dare say he dresses better than a lot of people I see today. Meh. I didn't care very much for the bickering in later seasons. In my first watch-through, I neither cared for it nor hated it. I would have kept utilizing the secondary characters (Naru, Usagi's family) in later arcs. This probably wouldn't change continuity at all, but it sure would make the fillers much more meaningful. Congratulations, Ktenshi and An Ordinary Girl!!! Chibiusa and Momo is my favorite. Sure, I'm not a big fan of Chibi but she deserves friends too. ;_; The episodes that feature Momo's association with Chibiusa are very good. I really like Usagi's friendship with Naru. I just wish it lasted longer after the first season. Day 11: Which transformation sequence do you like best and why? Moon Crisis Make Up! Aside from my love of the Super Sailor Moon and Chibi Moon forms (especially Super Chibimoon), this sequence has great music accompanying it and I enjoy some of the visuals such as the part with both skirt designs twirling on-screen as a transitional effect. I like the park scenes. Day 12: Least favorite anime-specific thing? Only one thing? What they did to Stars. Namely toning down the epicness considerably, omitting the Galaxy Cauldron from the story entirely and turning Galaxia into someone who was previously a virtuous hero that was forced into being an evildoer instead of her choosing that path on her own free will like she did in the manga. Day 23: If you were trying to get a friend into Sailor Moon, but could only show them one episode, what episode would you show and why? I would probably choose either the first episode, or some random episode from season one. Preferably a filler from the first season, so they aren't completely lost in the middle of the season's story line, and there's less to explain. Day 13: Is the anime your favorite version of Sailor Moon? Why or why not? I don't think I have a favorite version of Sailor Moon, but the anime has a very special place in my heart. Watching through it all for the first time put me in a genuinely happy mood I hadn't experienced in some time, and watching an episode of the anime never fails to lift my spirits at least a little and take my mind off other, more troubling things. ^^; I accidently dropped this for a couple of days. I finished the first part of a major writing project and just decided to switch off and recover. Hm, good question. My personal favorite is the Juuban Park in the first season. I am a bit of a naturalist so I appreciate detailed images of flowers, bushes and trees. Day 24: Have you seen all 200 episodes of the anime? If yes, was it worth the time? No, I have not. I watched all episodes from original season to S. I only saw certain some of SuperS, but I don't have the drive to sit through and watch the whole season (#MangaDidItBetter). And I never saw a whole episode of Stars. I know the stuff that happens in the season, but I have little interest to sit through episodes. Day 14: Best monster of the day? Papillon. Since no one else here has really said a favorite MoTD I'll list some more I really like to make up for it: Dumble, Sailor Cop, Gigaros, Cenicienta, Sailor Gamer, U-Ikasaman, Sailor Amuse and Sailor Antique. I'll go with Chibi Mamoru and Chibi Usagi not Chibiusa XD. Just a very cute moment between them. I really liked the battle with Cyprine and Ptilol. It was short, memorable, had some good choreography; showing our heroines outgunned for a bit and details such as attacks causing mild environmental damage. In the end, the Senshi had to use their brains to outwit those two and it was all executed surprisingly well for a series not known for its stellar fight scenes. The one I remember fondly for humor was "Total Chaos! The Messy Square Relationship". SuperS. Loved the themes about childhood as well the colorful visuals. Probably Naru mourning over Nephrite's death. Or Sailor Moon's loved ones dying at D-Point. When he had a fight to the death with Yuuichirou. But really, I think Episode 32 where he masquerades around as Tuxedo Umino Kamen is a collection of his best moments. The best of those to me is when he stands up to Akan in a futile attempt to defend Naru; it goes from comedic with his fried shrimp tossing to serious as you see his determination and devotion to Naru on display which wins her heart over and effectively begins their relationship. To be honest the first episode, it's great at explaining the story as a whole in fact and getting in the head how Usagi develops into the fighter she becomes in the later series. I'm not really sure. I guess it appeared at the right time. Or maybe it was a bit ahead. I like it, it was a great redemption device for Nephrite. But in the end I think Naru is best with Umino-- they're both the same age and it would feel odd to have just Nephrite out of the Shitennou be alive and chilling out with Naru, enjoying chocolate parfaits together with her after all that. If the Shitennou were to be redeemed/be revived, I'd want it to be all or nothing. Plus a big part of the appeal of Nephrite x Naru to me is the tragedy of it and the fact they couldn't be together. Technically yes but I've forgotten everything past S. ^^; Thank Serenity for VIZ! A ringtone, now that's something I haven't used in a very long time. But if I was to start using them again and wanted to go with a Sailor Moon one, I'd choose the Sailor Starlights' transformation theme; that beginning part sounds perfect for a ringtone. I'm a sucker for romance so my favorite moment was when they kissed just before Chibiusa appeared in the first ep of R.
I'd give Mamoru the attack "Tuxedo La Smoking Bomber". That way, he'd seem more like a member of the team, (even if he is not a Sailor Senshi) rather than the team cheerleader and occasional damsel-in-distress. And with that, my 30 Days are complete. That was very fun. Thanks for making this. Brought back some happy memories. \o/ YAAAAY!! Congratulations, magic713!!! I loved reading your answers and I'm glad you enjoyed the challenge! Don't forget to pick up your shiny stamp from the OP ^_~. Also, I think it's time for me to join the fray! Day 1: How were you first introduced to the anime and which episode was it? I'm up in Canada and saw it well before the Toonami days. In fact, I had already been watching another series (Pokemon??) at the time and there was an advertisement for Sailor Moon starting the following week. I didn't even need to watch the first episode. The promo had me hooked already!! I was just in awe after watching episode one. Absolute awe. It was magical, there was a Moon tie in and I loved the Moon as a kid... And cats... And mysterious good looking men XD. Yeah omg it was the complete package for my 9 year old self lol. I actually don't remember how many episodes were after school and when they switched over to the 6am time slot but I do know I didn't have an alarm clock yet at that age and I did get up to watch it religiously at some point... Man, so long ago XD. I can't find a scan of the local TVGuide for August 1995 when it premiered so I'll have to hit up the reference library sometime so I can finally clinch that detail in my mind! !